Senior Anthony Butler (Lincoln Park, Mich./Roosevelt) finished his final NAIA competition in 57th place with a Â time of 28:33. 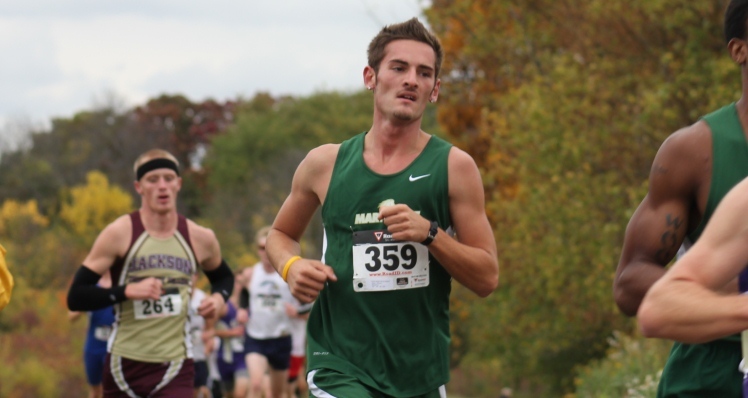 The senior concludes his four-year NAIA cross country career as the 8K record holder for the Mustangs. Next week, Butler (along with women’s cross country senior Shana DeVoe) will head to historic Lake Placid, New York to take on the field at the 2012 United States Collegiate Athletic Association (USCAA) National Championship Meet. The meet will mark the final race of Butler’s heralded career at Marygrove. Sophomore standout Marcell Houston (Detroit, Mich./Mumford) came in just behind Butler with a time of 28:45. The time was 12-seconds shy of Butler’s championship event time and was good for 59th place. George Jackson (Detroit, Mich./Mumford) led the next wave of Mustangs as the sophomore finished in 61st with a time of 28:57. The time was a PR for Jackson who came in just ahead of fellow sophomore Robert Crockett (Detroit, Mich./King) who also set a PR with a 62nd place finish in 29:00 flat. Freshman Jonathon Rutkowski (Riverview, Mich./Gabriel Richard) concluded his first collegiate season by working his way to a PR and finishing in 71st at 30:58. Akil Prowell (Detroit, Mich./Crockett) and Jalen Wilson (Detroit, Mich./CMA) crossed the line with times of 32:00 and 33:25 respectively.